The fact that brown eyes are common doesn’t stop them from being incredibly beautiful. Whether they’re amber, chocolate or light brown, this eye colour is warm, rich, and gorgeous. If you want to make them pop and stun even more, you can always try something new. After all, the addition of a smokey eye or feline flick always turns heads. Not only are brown eyes beautiful, but they’re also versatile and can pair well with countless makeup styles. This means that there’s plenty of new and exciting options for you to try, and we have the best ones right here. All you need to do is pick your favourite and get started. Brown eyes are versatile and can pair well with many colours, but some tend to match better than others. In particular, warm brown eyes appear best when paired with warm tones, such as shades of brown, orange, gold and bronze. These colours make brown eyes seem even richer and are always handy to have on hand. Brown palettes are especially useful for both natural, daytime looks and more sultry evening styles. While cooler tones can still work well, they can be trickier to match. Instead of opting for icy blue shades and plain purples, keep an eye out for jewel tones that’ll enhance the sparkle in your eyes. As for colours to avoid, reds and yellows tend to be the least flattering colours for brown eyes, so unless you know they suit your particular colouring, it’s best to give them a miss. A smokey eye technique is always a wonderful skill to have in your arsenal. While the traditional version involves black and grey eyeshadows, these tones can appear a little dark and drab for brown eyes. So, instead of the standard smokey eye, ladies with brown eyes should try a warmer variation of the style. Of course, a gorgeous, brown, smokey eye will make your eyes appear sultry and sophisticated, but for something with a little more glamour, opt for gold. A cool gold smokey eye is modern, stylish and perfect for a night out. The warm, glittering colour will also make your eyes pop in an amazing way. Like the smokey eye, a cat eye is a wonderful option to be able to whip out whenever you need. Whether it’s for a date, dinner with friends, or even the office, a cat eye is always a great style to have on hand. The only issue lies in perfecting the art of creating the line and flick. Once you have that covered, there are countless ways to wear this timeless trend. For a polished daytime appearance, you can’t go past a warm, medium brown shadow on your lids. The mixture of eyeshadow and eyeliner will create a lovely combination and complement your eyes nicely. For evening events and special functions, however, you may want to try a cat eye using a bolder shadow or a fierce eyeliner colour, such as cobalt. Whether it’s for New Year’s Eve, your best friend’s birthday, or simply a night out, glitter eye makeup can make a fantastic choice. The bold style is not only trendy and fashion-forward, but it’s also a lovely way to make brown eyes pop. Copper, gold, bronze and brown are all great choices to use for this look. Their warm tones combined with the light-reflecting particles will easily make your eyes glow and sparkle. If you’re searching for something a little different, however, some cooler shades, such as silver and pink, can also pair well with brown eyes, so give them a go. If you’re inexperienced with applying glitter, however, stick to easy methods of application, such as glitter shadows and pencils. If you’re sick of wearing warm, brown shades on your brown eyes, there are some other colours that you can try out. Blue may seem like an unusual option but it actually suits brown eyes extremely well. While light and icy blues may not be the most flattering colours for your peepers, deeper shades look stunning. Navy, metallic blues, and cobalt all create a gorgeous and complementary contrast when paired with your warm eyes. Likewise, purple is also a wonderful colour for brown eyes. Deeper plum and eggplant hues are useful for creating smokey eyes while bright shades, such as violet, and jewel tones, like amethyst, work best to make a bold statement. This tutorial will guide you through the dramatic style that can be created using either blue or purple eyeshadow. Bold, statement styles are great for special occasions, but for casual days you need something a little more subdued. Creating lovely, natural-looking eye makeup makes a wonderful option. While it won’t have as much impact as heavier makeup, it will subtly bring out your eyes and create a beautiful appearance. Neutral eyeshadows are the best for creating natural styles. For brown eyes, soft browns, taupes, and peach hues all create a gorgeous base colour option. When it comes to eyeliner, opt for brown shades instead of darker, black tones. Doing so, will create a softer appearance and define eyes without overwhelming them. While this type of makeup is a suitable and stylish choice for the office, it’s also an excellent option for nights when you want your lips to be the centre of attention. 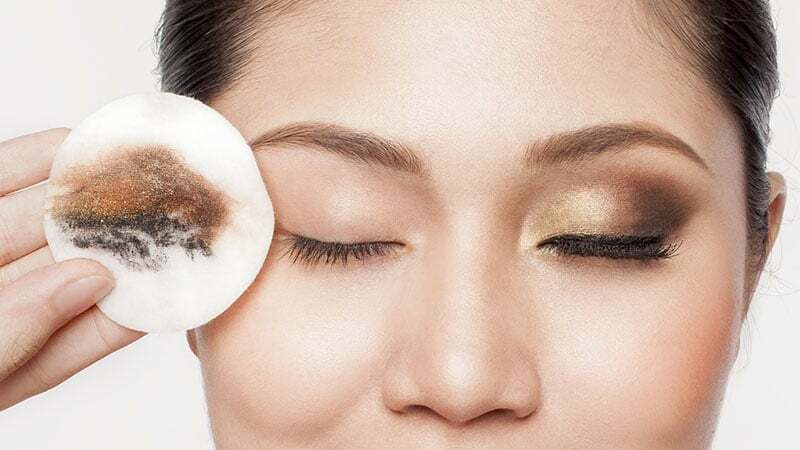 After a long day or night of wearing your stylish eye makeup, it’s essential to remove it. Not only can neglecting to remove your makeup lead to dryness, redness, irritation, and broken lashes, but it can actually also cause infection, so be sure to always remove it before bed. It’s also a great way to give your skin a chance to rest and recover without anything clogging pores. Unfortunately, the process of removing eye makeup isn’t always an easy one. While just using water and a washcloth might seem like a good idea, it’s not. Harsh rubbing can cause damage to your delicate eye area. Instead, your best option is to use a gentle and good quality eye makeup remover. They’ll make the process quicker, easier, and less damaging to your eyes.